Music meant something different to the Ancient Greeks than it means to us today. It was not simply sound or performance on an instrument; it was, in addition, an entire artistic collection of song, poetry, and dance. Music also sounded very different to the Ancient Greeks than it does today. Their system of organizing pitches, scales, and melodies is foreign to many of our basic concepts of music. It is probable that we would barely be able to appreciate Ancient Greek music because the way they heard music and were educated in musical art is so different from our own. In other fields of culture such as poetry and architecture, we look to the Ancient Greeks as the source of much of our modern artistic work. Philosophers constantly look to the philosophical masters of Greece and many of the roots of science and mathematics come from Ancient Greek times. Why then has the music of this great civilization been forgotten, and why is the music that we listen to today so fundamentally different? There exist very few documents of actual written music simply because the Greeks rarely wrote their music down. Most of the existing writings that we have about Greek music are not about what we call the “Art of Music,” but rather the “Science of Harmonics.” This Harmonic Science has little to do with music that is performed; it is primarily concerned with the acoustical properties of sound, and how these sounds relate to each other theoretically. Music as an art lost much of its prestige during the Roman dominance over Europe and the Mediterranean world. Writers such as Aristides Quintilianus, Athenaeus, and Boethius all tried to reconstruct music from Ancient Greek principles, but they all wrote after the 3rd century CE, long after the music of even the late Classical period of Greece had been largely forgotten. Even the oldest of the surviving documents that includes written melodies dates from circa 250 BCE, the Hellenistic Period of Greek History, which gives us little insight into the music of Archaic and Classical Greece. Scholars of ancient music, from the time of Plato through Cleonides in the Hellenistic Era, and Aristides Quintilianus in the Roman Era, greatly confused dozens of technical terms. In The Rise of Music in the Ancient World, Curt Sachs states, “The tangle of Greek systems, scales, keys, and modes is unbelievable. The Greeks started this confusion themselves; they misunderstood their own terms and almost promiscuously used them where [they] should have been carefully distinguished.” In addition, the Greeks rarely placed their inventions and developments in a proper chronological order, and they often attributed their advances to legendary figures (such as the musicians Terpander and Olympus) or to the Greek gods themselves. The great confusion of Ancient Greek music did not prevent many future generations of musicians from attempting to understand its nature and try to recreate its sounds, however. Musical forms of the Ancients Greeks have influenced music since the Medieval Ages. For example, all of the medieval “church modes” (such as Dorian, Lydian, and Phrygian) are inspired by the modes of Classical Greece (although the Medieval modes in truth have little to do with those of the Greeks). Also, the dithyramb, a dramatic work with singing and dancing, inspired the early Italian opera composers of the 16th century CE. Today, we hold so many aspects of Greek culture to be among the greatest achievements of humankind: the epics such as the Iliad, structures such as the Parthenon, and the sculptures and frescoes found throughout the Aegean world. For this reason, many people have wondered how the music of the Ancient Greeks sounded, and if it, too reached such high artistic levels. Because this music, unheard for thousands of years has intrigued so many musicians since the end of antiquity, it is fascinating to study its role in ancient times. Let us try to understand this great musical heritage through its historical, practical, philosophical, and mythological contexts. The history of Ancient Greek music truly begins with the Archaic Age, starting in 800 BCE. This is the period that Homer was believed to have lived in, and his works represent very early, but masterful creations of epic poetry. When we consider the definition of Greek music that includes poetry, song, and dance, it is clear that Homer’s poetic creations also included musical accompaniments. This period in Greek history is remarkable because both the poetry and music of the Archaic Age was highly advanced and mature. 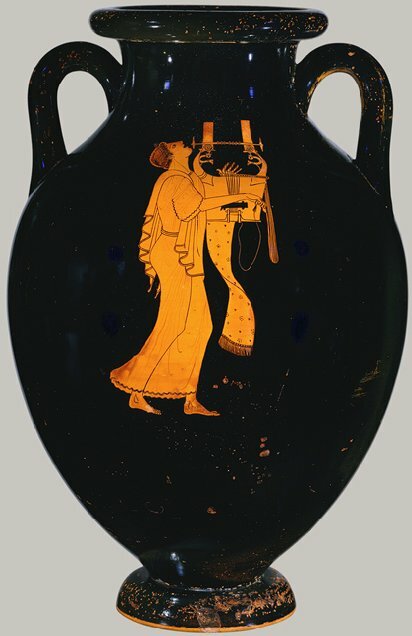 The music was, as Isobel Henderson states in Ancient Greek Music, “consciously removed from the primitive, barbaric, or rustic.”” Like Homer’s poetry, we have no knowledge of the period before this Archaic music came into being, so our history of Greek music must therefore begin at this point. Much of the music of this period was performed by traveling bards, professional musicians who would sing sections of works such as the Iliad, while accompanying themselves on their lyres. Other early Greek music included songs such as the paeans, which were a type of musical magic used in healing and medicine. These paeans are particularly important because they may hint at the influences and sources of Greek music from times before the Archaic Period (preceding 800 BCE). In addition to paeans, musical compositions used in religious rites and festivals were very common, and would persist throughout the history of Classical Greece. It is clear that music was an important part of Greek culture from earliest times. Henderson observes that the Iliad holds the status of music to be a true art “over and above a mere ritual,” and music, like its accompanying poetic and literary works, was greatly influenced by its social settings and tastes. Another central aspect of this music is that it was almost always newly composed. Every time a bard performed a poetic-musical work or a religious rite with music was celebrated, original music was required. This is one of the main reasons for the lack of written music in Greece; the demand for new music caused little need for previously composed material to be remembered. Music was also a unifying element in Ancient Greek culture. People from many different social backgrounds practiced and critically listened to music, including soldiers, members of the working class, aristocrats, and the heroes and gods of mythology. 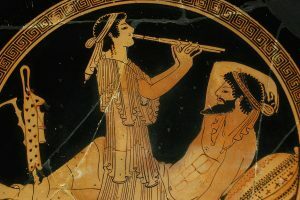 Music was such an integral part of the artistic life in Archaic and Classical Greece that it was only natural to have resulted in a musically educated public. We find that members of the aristocracy in societies across Greece patronized music in addition to playing it, especially in the period up to the 5th and 4th centuries BCE. Even though music in general was a unifying component in Greece, there is a definite divide between the higher and lower classes of music. Isobel Henderson alludes to Homer’s Iliad, when Agamemnon, the General of the Greek forces fighting Troy, hears the sound of an aulos (oboe) and syrinx (pan-pipes) from within the Trojan walls. This music of the Phrygian Troy is in contrast to the sounds of pure Greek music, which utilizes the stringed lyre and its relative instruments. The conflict between these two styles is significant, because they each develop into so-called “modes” of music that represent specific emotions and characters. On a larger level, this conflict is a clash between the culture of Greece itself, and its neighboring regions. How these modes eventually find a place within Greek musical forms, and how they affect listeners in different ways is a very important part of the Greek musical heritage. Both Plato and Aristotle discuss these modes and their traits, as we shall examine later. Through the history of Archaic and Classical Greece, music was used in many different ways. Particularly in the period up to the mid 5th century BCE, poets created works (incorporating music) for popular occasions such as dances, weddings, funerals, and marches, and wrote poem-songs about love, drinking, and politics. This popular, or “lyric,” movement started in the Ionian cities (on the Eastern coast of the Aegean Sea) and eventually became a part of the culture of Sparta. The works of this era were performed both at the occasions they represented, and at public music competitions. Competition in general was very important to the Greeks in many different fields. In addition to the great athletic contests such as the Olympic Games, poetry and music competitions were highly popular. A large portion of the mythological stories of Ancient Greece deal with competition between various combinations of people and deities, and this is certainly the case with music myths. These competitions were pan-Hellenic and gave poet-musicians opportunities both to demonstrate their personal skill and to share styles of performance from different regions. Musical contests were recorded from as far back as the 6th century BCE, and occurred at events such as the Pythian Games at Delphi and the Carnea Festival at Sparta. It is even claimed that the Pythian Games were originally solely for poetry and music contests, and only later included charioteer racing and wrestling. These ancient musical competitions are very helpful in reconstructing the Greek musical past, because the winners and circumstances of the events were often recorded on stone tablets that are still in existence. It is through one such a tablet, dating from the Hellenistic Period (probably during the late 2nd century BCE) that an important example of Greek musical notation is preserved with an engraving of the First Delphic Hymn. With the increase of popularity of competitions as a part of the great Festivals of Ancient Greece comes the development of dramatic forms of musical performance. The first of these forms, which probably dates back to the 6th century BCE, is the dithyramb. The dithyramb comes from the Phrygians of Asia Minor, and includes traits of this Asiatic realm such as its use of the aulos (an oboe-like instrument) and its excited nature. In its initial version it was a dance with singing and musical accompaniment, specifically about the birth of the god Dionysus. It eventually became simply a musical form without a set topic, and from the dithyramb comes the dramatic works of Classical Greece in the 5th and 4th centuries BCE. Because of its Phrygian roots and use of the aulos, the dithyramb plays an important role in the conflict of pure-Greek and foreign styles. As the history of Greece heads toward the Peloponnesian War and to the chaotic period between the End of the War and the Hellenistic Era, this conflict grows greater. The dithyramb (and its future forms) comes to represent the tremendous popular revolution of Greek music and the divergence from the traditional music in the “Dorian” and “Aeolian” modes. Aristides Quintilianus. “On Music,” Source Readings in Music History, ed. Oliver Strunk, rev. ed. by Leo Treitler, also ed. Thomas J. Mathiesen. New York: W.W. Norton, 1998. Aristotle. “Politics,” Source Readings in Music History, ed. Oliver Strunk, rev. ed. by Leo Treitler, also ed. Thomas J. Mathiesen. New York: W.W. Norton, 1998. Cleonides. “Harmonic Introduction,” Source Readings in Music History, ed. Oliver Strunk, rev. ed. by Leo Treitler, also ed. Thomas J. Mathiesen. New York: W.W. Norton, 1998. Hamilton, Edith. Mythology. New York: Warner Books, 1969. Henderson, Isobel. “Ancient Greek Music,” The New Oxford History of Music, ed. Egon Wellesz. London: Oxford University Press, 1966.